Imagine a job where you actually look forward to heading off to work every single morning. Leading a life many other people only fantasise about. The commute to work could be as easy as a ten-minute boat ride. Work now becomes an adventure in itself, diving almost every day among your favourite marine life while you also experience new cultures and lifestyles. It’s a potentially daunting task trying to understand what you might be letting yourself in for, so let us guide you through the minefield and explain all there is to know before you sign up for your life-changing training. Of course it’s not all fun and games and pointing at pretty fish in paradise, but the rewards are well worth the effort. Teaching others how to explore and appreciate the underwater world… What more could you ask for? …and everything you could possibly need, not just to pass your IDC & IE but to become an accomplished Instructor ready to enter the world of the professional diver! The IDC consists of two sections, the Assistant Instructor (AI) course and the Open Water Scuba Instructor (OWSI) programme. This structure lets you divide the course into two blocks to suit your schedule if you need to. However, most prefer to complete the two portions together, going through the entire IDC in a minimum of seven days. 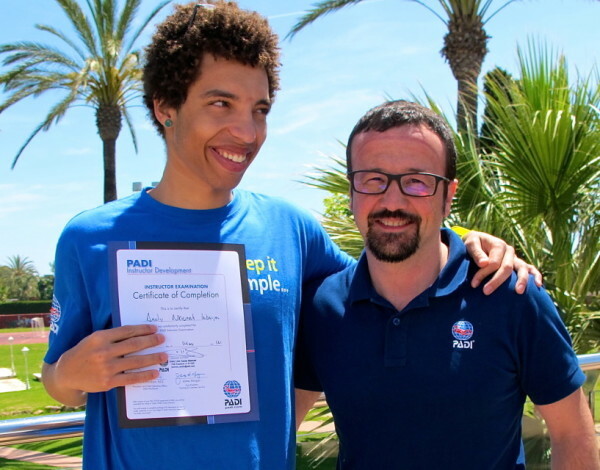 The first part of the PADI IDC is the PADI Assistant Instructor course. This course provides you additional experience as a PADI Professional and teaches you the PADI System of Diver Education. The Open Water Scuba Instructor programme portion of the PADI IDC further hones your leadership and teaching skills to prepare you for life as a PADI Instructor. After you complete your IDC, you demonstrate what you’ve learned in the Instructor Examination (IE). During the IE a PADI Instructor Examiner independently and objectively assesses your knowledge and skills, testing everything from dive theory to PADI training standards. PADI is the only certification organisation that requires an objective, independent examination to qualify as a professional instructor. This balanced and consistent evaluation process is one of the hallmarks that make PADI professionals the most demanded and respected instructors in the dive industry. What does it take to become a PADI Instructor? For more details on PADI professional level courses, or to book a free career counselling session with one of Simply Diving Go PRO’s Staff Instructors, call us on (0034) 600 506 526 or email us at gopro@simplydiving.com. Please note: All PADI Professional course prices include transportation to and from the dive sites in one of our air-conditioned mini-buses or by RIB boat and light refreshments (water, fruit juices and muffins).